You’re a good doggy parent. When traveling by car, your dog rides in the back seat for safety, as dogs and children should. You always buckle-in your medium-size or large dog using a strong-looking harness. Or you secure your small dog in a sturdy crate and buckle that in. Or maybe you at least use a booster seat or a cargo area barrier to prevent you from being distracted by your dog. You and your dog are safe, right? Wrong! Even if you’re using a product that supposedly has been crash tested, it is likely your dog is in danger … and so are you. Read what Lindsey Wolko, Founder of the nonprofit Center for Pet Safety, has to say about the safety of harnesses, crates and cargo barriers. And watch amazing crash test videos below (using life-like dummy dogs). Note: If you received this post as an e-mail please click here to finish reading and to view the videos on-line. PERMISSION GRANTED TO CROSS POST with a link back to truth4dogs.com. In 2004 my dog Maggie was injured during a short stop on I-66 in the Washington, D.C. Metropolitan area. She was wearing her safety harness but it did nothing to protect her. It was traumatic and I was very grateful that she wasn’t more seriously injured. The bad news: I had to pay her vet bills while the manufacturer who touted “safety” remained untouched and continued to market a product that put animals at risk. The pet travel side of things is simply the tip of the iceberg. In the years that followed, I turned a discerning eye toward the pet products industry, discovering that manufacturers did not have to test products before bringing them to market. There were no standards in place to ensure product safety and no oversight agent (beyond the FDA and USDA for food and pharma). I learned that manufacturers could make all sorts of safety claims but that it is up to the consumer to prove them wrong. Furthermore, pet owners have little recourse other than to return bad products to the store where they purchased it. For years I performed consumer trials, independently sampling and analyzing pet products. I found many bad products. While interviewing manufacturers we found a few instances where mom & pop shops would open out of their garages and market directly on the Internet. Many of these small companies didn’t even carry product liability insurance. In 2011, after fielding hundreds of questions from concerned pet owners about the safety of travel harnesses, I conducted a pilot study where we crash tested a small control group (using a doggy crash dummy similar to that used for humans). Some products claimed prior crash testing but failed to offer any protection to the pet or their human companion during an accident. After the second test indicated a horrific multipoint failure, the concept for the Center for Pet Safety was developed and we haven’t looked back. I have been working to gather the funds we need to further protect and educate the consumer. Our goal is to ensure that these pet safety devices offer measurable protection, prevent injury to the human vehicle occupants and give the dog the best possible chance of survival in the case of an accident. Harnesses: Many manufacturers claim to have “crash tested” their products but at present, there are no rules to set what a “pass” or “fail” means. A manufacturer may claim their product “passed” while allowing the dog to escape or be ejected during an accident. The dog could have even been injured or killed as could have the human occupants! In addition, manufacturers don’t have to reveal that they tested only one size (likely for the 30-35 lb dog) or even that the product failed the testing! 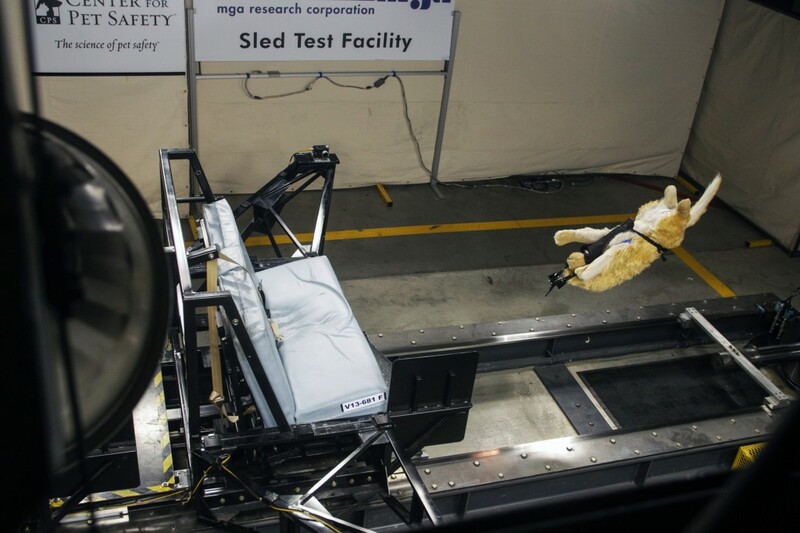 In 2013, only one dog safety harness “passed” the CPS crash test. The Pet Safety Center is defining standards we will soon publish. The good news is that we are seeing more and more manufacturers increase their product testing and we applaud those efforts. We work very hard to constructively engage and involve manufacturers when we work in the test lab. We have a licensing program where manufacturers can use our test equipment (static dogs and crash test dogs). We don’t charge them but do stipulate the test facility and we require a copy of the data from their testing. Many manufacturers support our mission. Crates: In 2011 we conducted preliminary crate testing. We are currently looking to fund a comprehensive crate study. The news on crates is not good. These products offer little protection to the dog and may actually may increase the risk of injury to the rear seat passengers (when placed in the SUV cargo area). The results indicate that even a 55 lb dog can exert enough force to break the seatback during a crash. During testing, the crate was destroyed. In a real accident, a frightened dog would have theoretically been able to escape the confines of the crate. Unfortunately, given the test evidence and the resulting condition of our crash test dog dummy, survival in an accident like this would have been unlikely — hence the reason CPS is working to fund a full crate study to give pet owners a “best practice” to follow. Manufacturers of some crates costing several hundreds (and even thousands) of dollars claim crash testing. While the products are strong, in one particular case, we know that the manufacturer actually removed the rear seat to ensure that the product would “pass” crash testing and avoid evidence of breaking the seatback. Small Crates & Carriers: We currently advise pet owners to place small crates and small pet carriers on the floor of the vehicle behind the driver or passenger seat. We know that strapping the crates or carriers in place using the seat belt may exert a crushing blow should an accident occur. Booster Seats: These products are largely untested by the manufacturers. Our team is very concerned about placing the dog in an elevated position, near glass and airbags and aligning the dog with the head of the front seat passengers. Pet owners are told these products are “safe” when in reality, should an accident occur, they will likely increase the risk to the human vehicle occupants and to the dog. If a pet owner insists on using a booster seat, we recommend they replace the connection/harness included with the product with a quality crash tested harness. The connections/harnesses included with the booster seat have likely not been tested. Cargo Area Barriers: Fabric barriers will likely provide only distraction prevention. Tension barriers frighten our team because they can shift during even a sudden short stop. In an accident we fear they will dislodge and increase the risk to the human vehicle occupants. This is another area that requires more research. Another product being tested — Life jackets: We’ve recently signed a new research partner who conducted a pilot study in 2012 about pet life jackets. From their collected data, they found that some of these products actually increase the risk of drowning because they are so poorly designed. Unlike human lifejackets, pet lifejackets are not regulated by the U.S. Coast Guard. We are working to fund a comprehensive, groundbreaking study that will assess how a product actually interacts with the body of the dog and measure the product’s performance to support flotation of the animal. More studies are needed. We simply have more work to do than we have funding for. We’re hoping pet owners stand with our organization and offer some financial support so that we can accomplish our mission to ensure the safety of the products we purchase for our pets and hold manufacturers accountable for troublesome products. In the future we intend to launch additional studies including collar, leash, toys and more until we cover every category to ensure pet product safety. We will also be launching a certification program to ensure pet owners can easily identify products that meet the published standards. It’s a big mission. If we can raise the money, we’re going to develop a database similar to the Consumer Product Safety Commission and collect reports from pet owners who have encountered bad pet products. That way, through trend analysis, we can get in front of concerning products and make recommendations to consumers before a beloved pet dies. There is no oversight agent and that’s our first step is to monitor the consumer complaints and work to do something about them. Please help us help your dog or cat. Forward this post to friends and post a link on your website and/or Facebook page and Tweet the link as well. If everyone donated just $5 or $10 we can do the work to help make our pets and ourselves safer. http://centerforpetsafety.org/donate-today/ The Center for Pet Safety is a registered 501(c)3 nonprofit research and advocacy organization and your donations are tax deductible to the fullest extent allowed by law. Check with your financial or tax advisor for details. Thanks for any help you can give us to help keep your dog or cat safe. Watch more jaw-dropping crash-test videos at The Center for Pet Safety. Download the 2013 Center for Pet Safety Harness Study Summary Report scroll to p. 10 to see the results. Note from Jan: Only the harnesses from Sleepypod.com passed The Center for Pet Safety’s test. We purchased their “Air” model carrier but have not received it yet. We paid full price and are not connected to them in any way, nor is the CPS. Sleepypods’s videos are worth a trip to their website. These people have really thought about how to make harnesses and crates. We’ll let you know what we think once we’ve tried it. BTW, we found the prices on their website to be considerably better than elsewhere, although this could change. I use the Pet Tube Car Kennel (http://www.petego.com/category/24/Car/product/121/PetTubeCarKennel) which is a soft kennel with straps that hook onto the rear seat head rests. The dog is completely contained and with side air bags, I trust my pets will be safe. I find this very interesting since I was about to order the “Pupsaver” dog car seat. It claim to be the only dog seat that passed the car crash testing. Can you recommend the best pet seat out regardless of price? I have a 5 and 7 pound Yorkie and 2 larger 12 pound Yorkies. I want to get a booster seat for them. They already have a Kurgo Crash Tested Harness that seems to be very well made. I have found 2 booster seats by Animals Matter, Inc. that I like. They are the LA Dog Company Rider Studio Car Seat @ $150.00 and the Companion Standard Car Seat @ $200.00. Before I pay this kind of money for a dog car seat, I want to make sure it has passed the Car Crash Test. I was told by their Rep. that both car seats had passed the Car Crash Test. Can you tell me how I can get a list of the car seats that have past the car crash test? I am not sure she’s telling me the truth. Barbara, there is no complete list. And there’s testing and there’s testing. Poke around the research at http://www.centerforpetsafety.org. Also ask each maker exactly where the testing was done, if it was independent testing and if they have any proof that the car seat passed and what passing means. If it’s a booster seat, I know that the center does not recommend any of them, and neither do I. Sleepypod would likely fit the two smaller dogs but not the larger ones. Do it sounds as though you would reco a harness over a crate? What is the harness that passed your test. I see that Sleepypod is the harness that passed your test. I went to their site and saw that they offertwo versions – the Utility and the new Sport. The Sport looks easier to use in that it doesnt need the car seat straps. But I wonder how the Sport, in using just the seatbelt, would be able to keep a wondering dog securly in the seat as a seatbelt doesnt stay snug until it is jerked. Have you tested the new Sport or have you gotten any feedback on it? Thank for great post about the dogs. I love this blog so much ! I’ve seen this somewhere recently, was it in Dogs Today I wonder. I have always worried about this, too. I recall a harness called I think the Roadie which was meant to be safety tested as much as you could do. Not sure who was meant to have tested it.